This powerpoint is part of a lesson that provides an overview of health care infrastructure in East Africa. This powerpoint was created to introduce the East Africa context in a class on health. This is a syllabus for a graduate seminar taught by Dr. Mia Fuller, Italian Studies, University of California, Berkeley, 2011. The seminar approaches Italian colonialism through the prism of the longest-held Italian (ex-) colony, Eritrea, and its capital: Asmara. MTG is a sport and development project established in Kilifi, Kenya in 2001. 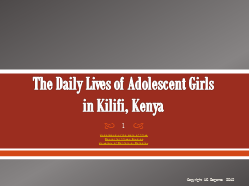 The organization uses local and youth centred approaches to tackle social and economic issues impacting girls. The project uses football to develop essential life skills – confidence, leadership, self esteem – ensuring girls’ participation as leaders and decision makers. Football also provides a unique entry point for reproductive health, human rights and economic empowerment initiatives. Playing by Their Rules : Coastal Teenage Girls in Kenya on Life, Love and Football. 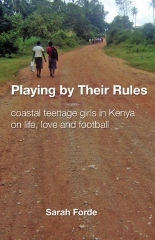 Read more about Playing by Their Rules : Coastal Teenage Girls in Kenya on Life, Love and Football. The blog entry by Heather Ford, “The Missing Wikipedians.” Hblog.org, February 16, 2011. http://hblog.org/2011/02/16/the-missing-wikipedians/. Article: Heather Ford, ‘The Missing Wikipedians’ in Geert Lovink and Nathaniel Tkacz (eds), Critical Point of View: A Wikpedia Reader, Amsterdam: Institute of Network Cultures, 2011. ISBN: 978-90-78146-13-1. 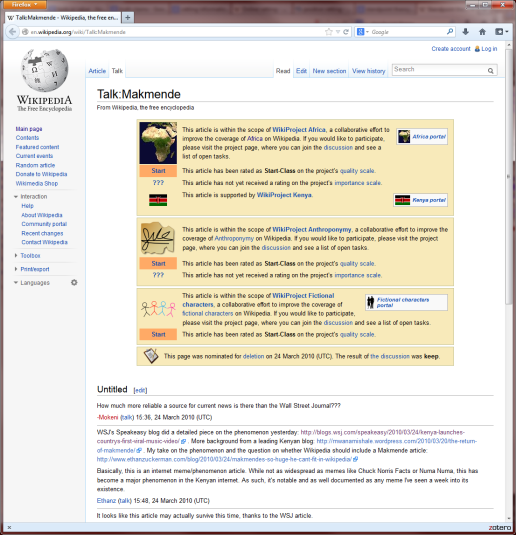 Explore the 'Talk' page for this Wikipedia article on Makmende.